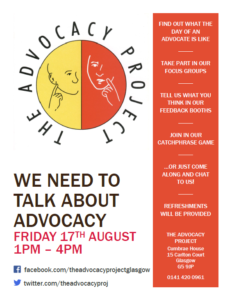 The Advocacy Project are holding an open day on Friday 17th August between 1pm and 4pm! This is an opportunity to come and talk about advocacy, give your feedback on our service or find out more about advocacy. If you are interested in attending please contact us, we would love to see you there!